Summer has arrived again and this year, it might be hotter than ever before. This means that it may become more difficult to stay clean and comfortable in the scorching heat. Well, look no further! Here are a few simple ways to go about feeling cool and fresh as a flower, even on the hottest of days. Choose the right shoes: It is important to think not only about your looks but also about your feet when you buy new shoes. During summer, it is best to choose light shoes that allow the feet to breathe and remain dry at all times. Light shoes are easier to maintain and they do not pick up odor as much as the heavy ones. Wear appropriate clothes: Wear light, loose-fitting clothes that allow your skin to breathe. Cotton is a natural fiber and does not trap heat as much as polyester or other synthetics. Comfortable clothes in cotton and linen can be worn for ease at all times. Change your socks: Use only socks made from cotton as they absorb perspiration a lot better than socks made of synthetic materials. Also, change them as often as possible, because dirty socks, just like dirty clothes, can harbor microorganisms and cause skin infections. Bathe and Shower: Bathe and shower at least twice a day to keep sweat away and remain fresh at all times. Not only does a good shower eliminate bad odor, dirt, and microorganisms, it also sufficiently cools the body. 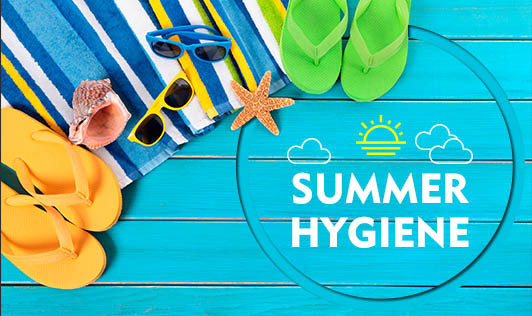 So, follow these simple tips to stay fresh this summer!